So I wanted to make potato skins as one of my appetizers. I had them at a restaurant about two weeks ago and thought, “how simple is this recipe?” I decided to re-create potato skins for the Superbowl in the most effortless way possible. There are ways to make this recipe more gourmet, and take longer, but I honestly was going for quick and simple in this easy appetizer. Did I mention that this version has fewer calories than your restaurant favorite, too? You’ll yield two potato skins for each potato. For two of us, I made 8 skins, and we devoured them all, as part of a dinner. First, bake the potatoes using either the oven or microwave. Either way, scrub them beforehand. Unlike other recipes with potatoes, you’ll actually eat that skin, so make sure its nice and clean (without soap, of course!). Then rub them with olive oil. They’ll need about five minutes in the microwave, or about an hour in the oven, at 400 degrees. Don’t forget to poke them with a fork before you use either method. When the potatoes are finished baking, slice them in half. Let them cool a bit before you start digging out the insides. Using a pot holder, I carefully removed the insides of each half, leaving about 1/4 – 1/2 inch in every skin. Then place your potatoes on a cookie sheet, or in my case, a piece of my favorite stoneware. In a normal recipe, you would stick these back in the oven with additional oil and salt too. But to avoid the extra time and fat, I went straight for the cheese. I didn’t want to have a heaping mound of cheddar on the skins, I first added some sour cream to the skins, so they wouldn’t come out too dry. I use fat-free sour cream – definitely one of my favorite fat-free foods! Then on top I added a sprinkling of cheddar cheese. At some point while making this, I discovered that I didn’t have bacon. So I substituted with some finely diced ham. I first gave it a quick fry in the pan before adding it to the potatoes. And then into the oven they went for about 15 minutes at 350. These potato skins are best served immediately. I also topped them with green onions and served them with a side of sour cream. For these “pigs” in a blanket, you’ll need two items. 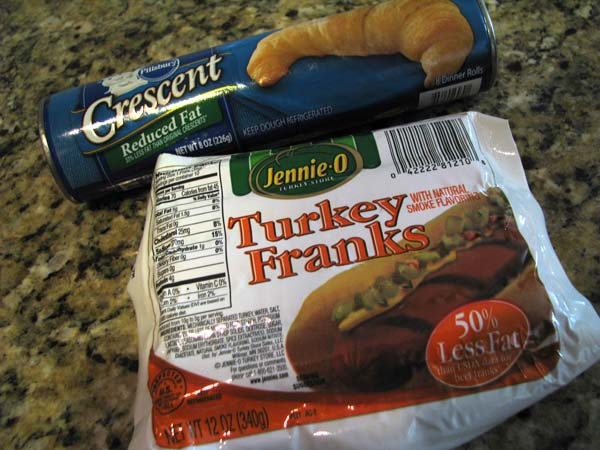 Because this is a healthier version, we are going to be using turkey franks and reduced fat crescent rolls. One package of each will make 30 pigs in a blanket. Pre-heat your oven to 375. 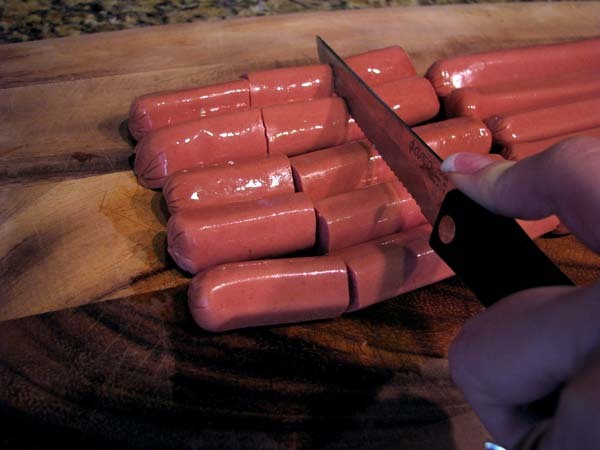 First, cut your turkey dogs into thirds, creating 30 mini dogs. You can also cut them into fourths to make them bite size. Carefully unroll your crescent dough. 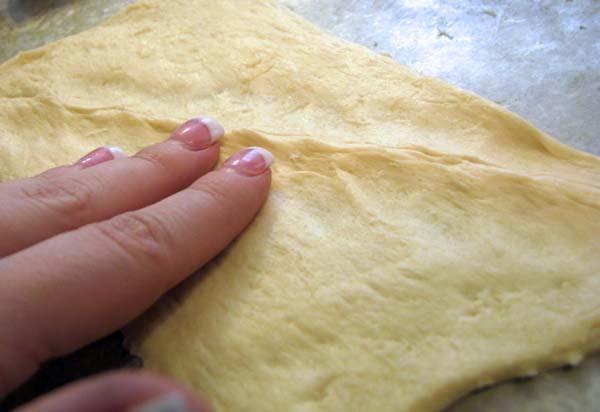 Divide the dough into four portions, using your fingers to press together the seams on the triangles from the original 8. One at a time, using a pizza cutter, divide each of the four pieces of dough into 7-8 pieces. (For 30 pieces, 2 will have 8, and 2 will have 7). You could also use a knife, but it would take a lot longer and require more patience! Next, roll the dough around the turkey dog like pictured. 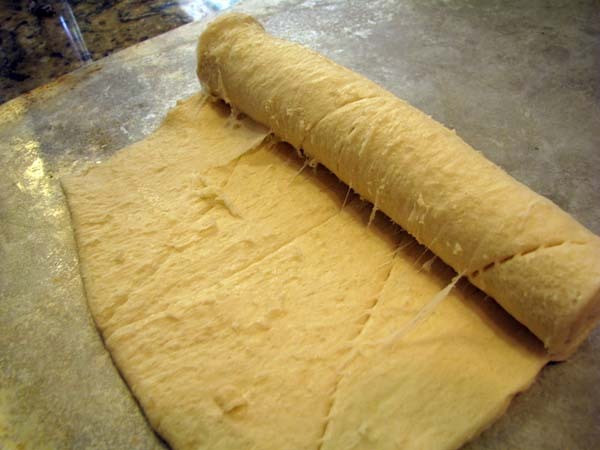 Instead of moving the frank straight up, roll at an angle to get as much dough around it as possible. If you need to, stretch the dough at the end so that it is underneath the turkey dog. Make sure you place them seam side down on the cookie sheet. You don’t need to grease your cookie sheet because of the oil naturally found in the dough. Place them about 1 inch apart on the sheet and bake at 375 for about 10 minutes or until golden brown. When done, the turkey franks will be darker in color too. Serve with a side of ketchup and mustard for dipping. Use toothpicks for mini bites to make game day grazing easier. Yum! The Man Cave Cookbook is the essential guide to cooking for The Man Cave, whether you’re hanging out solo or entertaining a crowd of Cave Buddies for the big game. Packed with more than 150 recipes for mouthwatering breakfasts, lunches, dinners, soups,chili, stews, snacks and desserts that are quick and easy to make. Step-by-step instructions make it easy to crush it in the kitchen – even if you have no cooking skills whatsoever. Impress your Cave Buddies. Even better, impress the wife or girlfriend! You’ll be ready for the next big game (or any other Man Cave event) ’cause the Man Cave Cookbook’s got your back. INCLUDES: The Man Cave Cooking Resource Guide – your road map to cooking terms, abbreviations and more to boost your Man Cave Cooking Skills! The Man Cave Cookbook is great for anyone who wants to CRUSH IT IN THE KITCHEN- eat good food, make it really fast and keep it simple. The Man Cave Cookbook. It’s Man Cave Food for Man Cave Men. Have you ever come across a great pizza recipe only to discover you need half a day just to prep the dough! Eek! I don’t know about you but I just don’t have that kind of time when I need to get dinner on the table. Sure, homemade pizza dough can be worth the effort, but on Dish Dash Dime, we’re talking about an easy weeknight meal. If you’re going to use a pizza stone, place your stone in the oven and pre-heat the oven to 425. I use two pans, one for pizza and one for bread sticks. For this recipe you will need one packet of rapid rise yeast, 1 tablespoon of sugar, 2-3 cups of flour, 2 tablespoons olive oil, 1/2 tsp salt, 1 tsp Italian seasoning, 1/2 tsp garlic powder, and corn meal if you’re using a pizza stone. First, add one cup of warm water to your stand mixer, with the dough hook attached. Add the yeast and sugar and let sit until it comes together and looks foamy/bubbly. If you’ve never worked with yeast before, here’s a couple of hints. First, you need the temperature of the water to be warm – not boiling, but not lukewarm. Also, if you don’t see any foaming or bubbles after around 10 minutes, your yeast might have expired. This is called proofing. 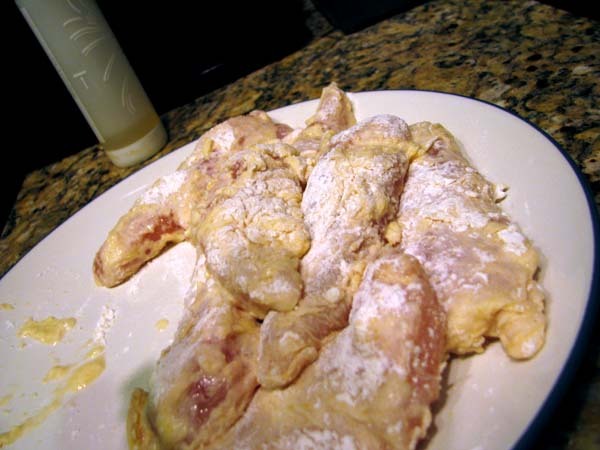 While you wait, combine your Italian seasoning and garlic powder with olive oil. Next you’ll start adding the flour. While adding the flour, I use the lowest speed possible. To be honest, I actually don’t measure this part anymore. I watch the dough come together and make judgements about how much more it needs. Start with one cup, and then add your olive oil mixture and salt. Next, add your flour 1/2 cup at a time until you reach 2 1/2 cups. 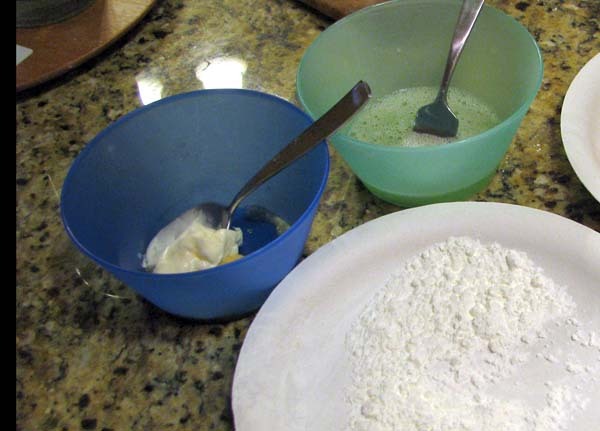 If the dough is crumbly, add 1 tbsp of water at a time until the dough becomes smooth again. When the dough is done mixing, it should be elastic and smooth. Let it rest on the dough hook for about 5 minutes. Next, move the dough to a floured work surface. Mold the dough into a round and cover with a towel for 5-10 minutes to rest. This is a great time to prepare your toppings. For this particular pizza, I shredded up some leftover chicken. Then I added about 1/4 cup of BBQ sauce. I also chopped up some onion and scallions. For the cheese, I used a mixture of both mozzarella and cheddar cheese. After the dough has rested, the size will be a bit larger. Punch down the dough and then roll it out to your desired width. At this point, I usually remove a part of the dough to make bread sticks. I like a thin crust pizza, so I roll out my dough the entire width of my 14 inch pizza stone. If you like thick crust, use a small pizza pan and keep the dough thicker, or even make it in a pan with a raised edge. Prepare a pizza stone with cornmeal. For a regular pan, use non-stick spray. Carefully transfer your dough onto the pizza stone. I always have my rolling-pin ready for any weird pulling that happened during the transfer to help even out the dough. With the pizza stone, you’ll smell and hear the sizzle immediately. At this point I try to quickly prick the entire crust with a fork and then brush the edges with leftover olive oil and Italian seasoning mixture from earlier. For this pizza, I used a BBQ sauce base. Spread your desire amount across the crust. Next, add your toppings, be sure to not load up too much in the middle, to ensure an even cooking process. Finally, add your cheese, trying your best to make sure that the cheese is even throughout the pizza. I used about 1/2 cup of cheddar and 1 cup mozzarella. Since I’ve only used a pizza stone, I can’t speak for the timing on a regular pan. I usually put the time on for 15 minutes, and then check it every 5 minutes from there on out. With different toppings, it will depend on the timing. The thickness of crust and the amount of toppings will also change your cooking times. For the bread sticks, I simply roll them out into an oval shape. I then add some olive oil, garlic salt and a sprinkling of cheese. I put this together while the pizza is baking and add them in around 10 minutes in so that they both come out around the same time. Usually I try to not open the oven while I bake, but in this case, with the pizza stone, you should be fine. Then out they come, all golden brown, melty, and bubbly. I have to admit, about every 5th pizza I make, the pizza just doesn’t come together. I’ve had dough that doesn’t rise right, dough that is too dense, or too flimsy. It always tastes great and we always gobble it all up before coming up for air. But I don’t claim to be a master at this, and neither should you! So don’t get disappointed if this isn’t the best professional gourmet pizza you’ve ever seen or tasted. Afterall, I’ve heard the best pizza crust is made from the right water – so who really knows!? I’d love to hear about your favorite toppings. Does anyone have a favorite homemade pizza? We topped our pizza with fresh diced tomatoes, since we love the crisp cold texture against the melted cheese. Seriously wish I was eating this right now! 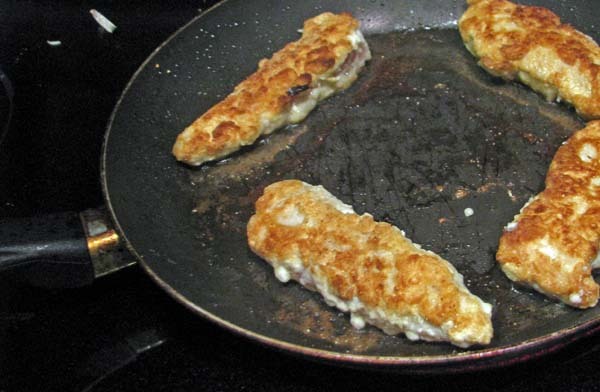 When it comes to frying things, it usually reminds me of a big, greasy mess. Both on the counter and later in my stomach. But they are just too good to pass up sometimes. And what works even better when I have those greasy cravings, is to make my homemade version. Next, grab about 1.5 medium sized potatoes per person. Wash, peel, and slice the potatoes into even thickness to ensure even baking. I used my mandoline slicer, but you can use your knife too…and lots of patience! Try to get as much moisture out of the potatoes as possible. This is important so that you get crispy potatoes and not soggy limp ones. After they are mostly dry, separate them and sprinkle with cornstarch. Toss together and then separate the fries again to let them dry. Leave them aside while you prepare your chicken. Since this is so messy, I don’t have a step by step process of making the tenders. Its quick and easy though – just use one hand for wet ingredients and one hand for dry. First lightly coat the chicken with flour. Then dip it in your egg mixture. Next put it into the cornstarch mixture. Have a plate ready for transport to the frying pan. Before you start your chicken, toss your fries with some olive oil, dash of salt and pepper and about a 1 tsp paprika. I use stoneware for the best crispy texture. 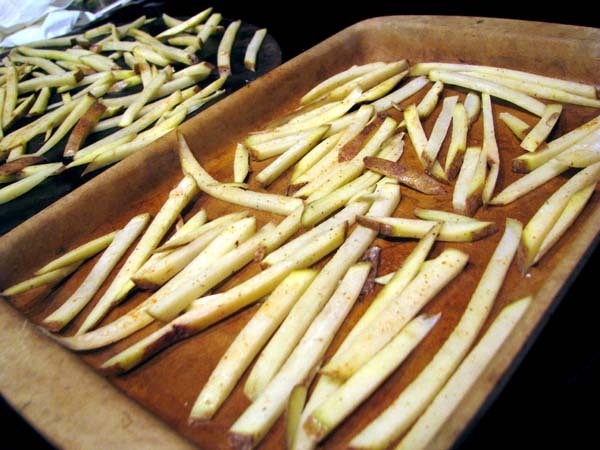 If you use a cookie sheet, be sure to spray with oil so the fries don’t stick. Also, with a cookie sheet, I recommend turning over the fries halfway through baking them. Heat about 4 tbsp vegetable oil in a frying pan. Add about 4 or 5 tenders at a time. If you add too many, the oil temp will decrease, causing your tenders to become soggy and just absorb the oil as opposed to getting a nice crispy skin. In this step, you are just browning the chicken. Each batch should take between 3-5 minutes. 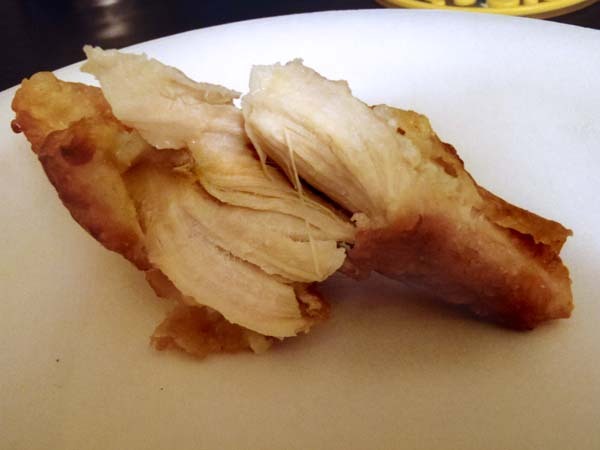 Chicken should not be cooked through when you remove it from the pan. The outside should be a nice golden brown. 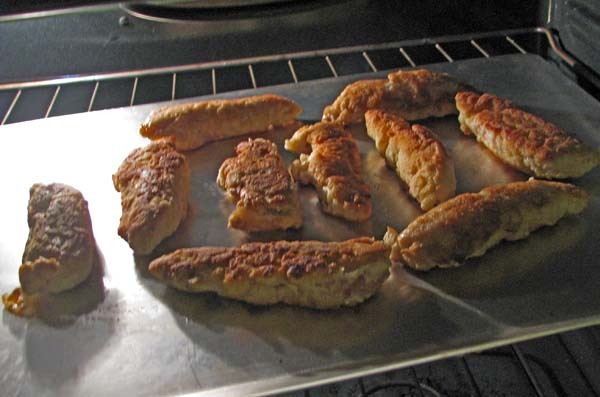 Place chicken on an ungreased cookie sheet, as the chicken already has oil on it, and place in oven for 10 minutes or until cooked through. Pull both fries and chicken out of the oven. 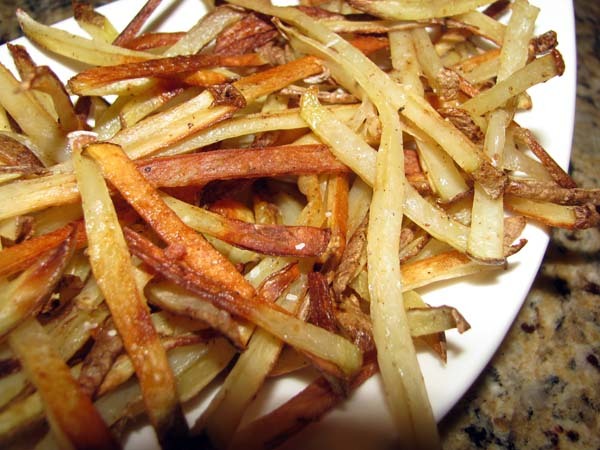 Immediately sprinkle fries with salt and pepper and toss. Transfer to serving dish and enjoy your not-so-deep-fried crispy chicken and french fries! 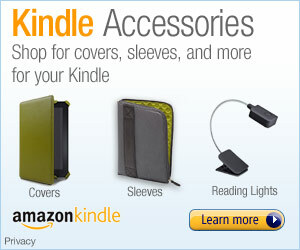 To get the Kindle app for any device – click here. What’s in the Slow Cooker? I just love leaving work on the days that I have dinner in my slow cooker. There is an element of surprise for me when I walk through my garage door and take in the initial scent that fills up my entire house. I don’t think I’ve ever actually followed a slow cooker recipe. I just think about what kind of food and flavors sound good, and into the crock pot it goes. This day was no different. 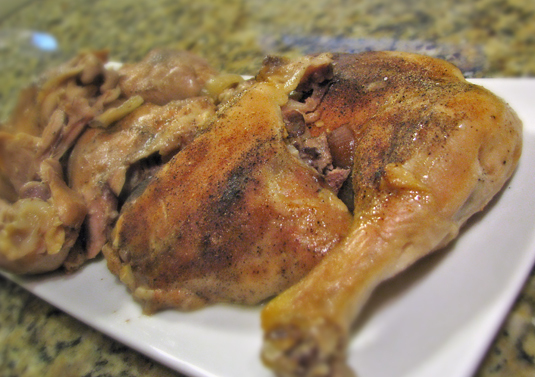 I got these chicken leg quarters on sale at Bashas for $0.97/lb for a total cost of $4.47. I love getting these kinds of packs on sale because they always last for more than one dinner, and they’re always cheaper than buying boneless skinless chicken breasts (which sale cycle is much more rare than bone-in chicken). If the bone is in, generally, into the slow cooker it goes. 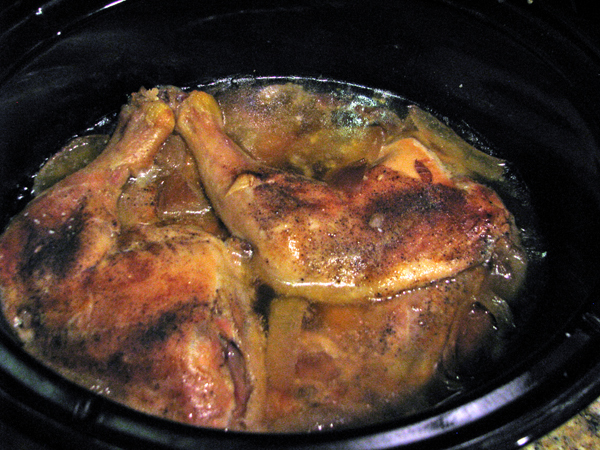 I began by adding one can of 98% fat free chicken broth to the bottom of my slow cooker. In order for your slow cooker to work properly, you need at least a 1/2 cup of liquid down there. Otherwise you’ll end up with some dry-charred-shoe-leather skin, not to mention awful clean up duty! Next, I carefully sliced most of the skin off of the legs. No need for the extra fat, right? This was a pretty easy process considering it was my first time butchering the skin like that. After that, I added equal parts of garlic powder, onion powder, paprika, and pepper. I then gave each a sprinkle of sea salt. And into the crock pot they went. Two were on the bottom, pretty much marinating in the chicken broth, and two were on top, which meant they would get a nice crispy skin. I had about two seconds until I absolutely needed to get in the car and go to work. So I grabbed an onion, quartered it, and added that to pot. 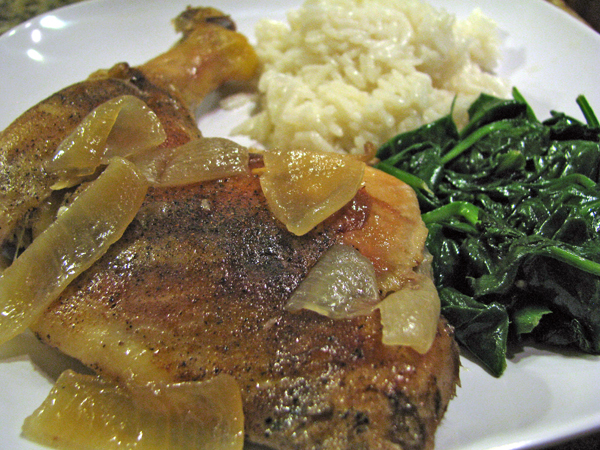 Hubby and I love onion – I put it in everything! But please adjust to your own tastes. And then this. my friends, was my surprise when I got home. I call it a surprise for a reason. With the crock pot, you can’t really test it or taste it as you go along. Raw meat goes into a container for 7-8 hours on low and you hope that something edible comes out of the container when you return home. Today was a wonderful, delicious surprise. I carefully pulled the chicken out of the slow cooker, trying hard to keep them intact as the chicken was falling off the bones. I put a small pot on the stove to make some jasmine rice using 3 parts water and 1 part chicken broth from the slow cooker. 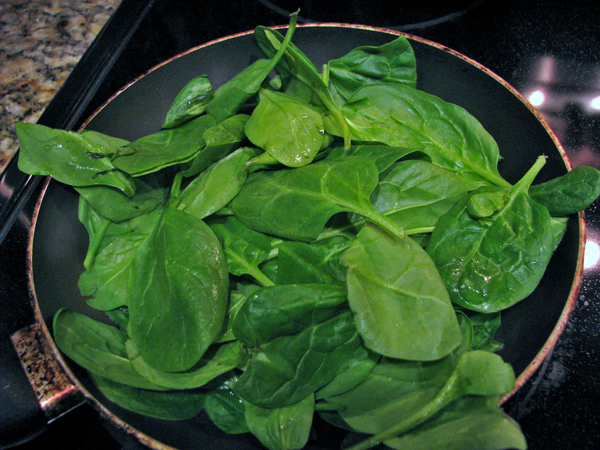 I had some leftover spinach that was about to expire, so I also sauteed some spinach with butter, olive oil, and garlic as another side dish. 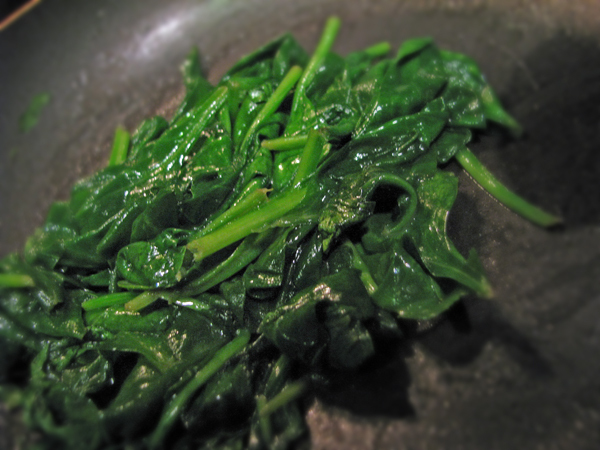 Important thing to note about spinach. This huge bunch is really only one small serving. For the record, I got home at 5pm, took pictures, made rice and spinach, served and ate dinner, and we were back out the door at 5:45, with about 10 minutes of relaxing to spare. Now that’s what I call a weeknight meal!